Rabbi Katy Z. Allen, Elan Riesman, and Sharon Rozines took part in an outdoor Shabbat at Wachusett Reservoir. 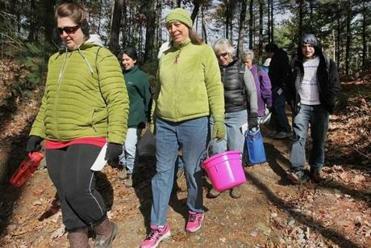 BOYLSTON — Rabbi Katy Z. Allen and her tiny congregation make their way through the woods on a windy autumn morning, stopping now and then to sing and pray portions of the Shabbat service. They reach the Wachusett Reservoir and spread out along the water’s edge to collect wild cranberries, slowly filling their buckets. A meditative quiet settles in. 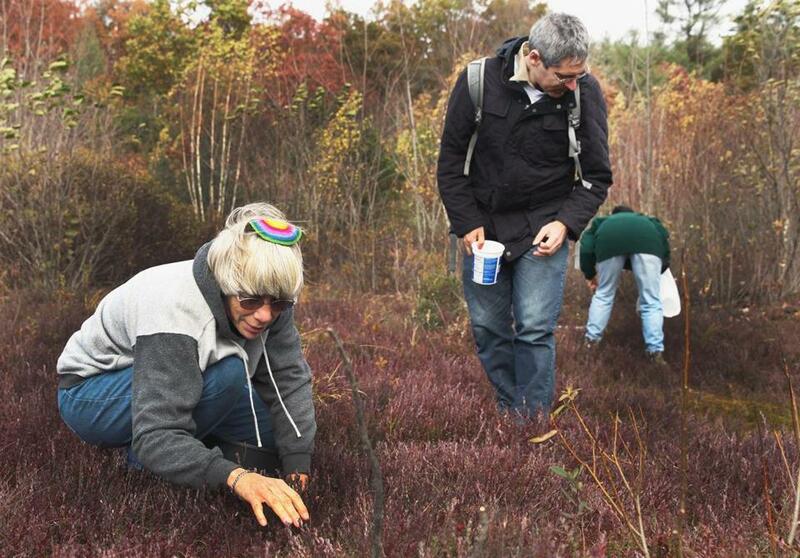 Many congregations from across the religious spectrum hold the occasional outdoor service, but Allen’s gathering of Jewish environmentalists and nature lovers almost always worships outside. Allen calls her congregation “Ma’yan Tikvah,” or “a wellspring of hope” in Hebrew. In May, she organizes a bicycle Shabbat, with stops for prayer and picnicking. In August, she holds a potluck Shabbat dinner, then everyone heads outside to watch the Perseid meteor showers. High Holiday services happen in the woods. Praying outdoors adds another dimension to just being outdoors, Allen says, and being outside adds another dimension to the prayer. “There’s an openness, an endlessness,” she says. Stephanie Mitchell, Sharon Rozines, Robin Bernstein, Sue Schy, Gabi Mezger, and Elan Riesman worshiped in the outdoors at Wachusett Reservoir in Boylston. The group is more a gathering than a formal congregation; its size and makeup fluctuates. On this day there are just eight people, but High Holiday services can draw as many as 50. Some people come regularly, others just once a year — but that, Allen notes, is no different from any synagogue. She tries to keep in touch now and then with those who drift in and out. If Ma’yan Tikvah is a little unconventional, so is Allen, 62, who also works as a chaplain at Brigham and Women’s Hospital. She grew up in Wisconsin, in a family that loved being outside. Her father was a botanist who grew up on a farm, and her mother’s undergraduate degree was in biology. They camped and hiked together, and spent summer vacations in rustic cabins in the Porcupine Mountains Wilderness State Park in Michigan’s Upper Peninsula. But she had little experience with religion, except for a couple of years during middle school when she attended a Unitarian Universalist church. Allen remembers having intense conversations with the minister’s daughter — who later became a Lutheran pastor — about whether God existed. She put aside spirituality as a young adult. She married, taught high school biology and general science outside Boston, had children. When her son began asking questions about God, she began searching for ways to help answer them. Her then-husband was Jewish, so they began with a havurah — a Jewish group that meets for prayer, learning, and celebration of holidays. Later, they brought their children to the Sunday School for Jewish Studies in Newton, a Hebrew school for children and families that meets Sunday mornings. A turning point in Allen’s spiritual life came during a High Holiday service at the school. They joined a reform synagogue. When Allen and her husband divorced, she moved to a conservative congregation in Wayland. She loved the Hebrew portions of the service, even though her comprehension was limited. Still, she wanted to learn more. She was working in educational publishing, writing, and Jewish education, but as the years passed, she had a nagging feeling that did not go away: She wanted to become a rabbi. In 1999, 11 years after she converted, she began attending rabbinical school part time at the Academy for Jewish Religion in New York. When she finished in 2005, she worked at a synagogue in Winthrop, but it was not the right fit. Allen’s current partner, Gabi Mezger, asked her what she would do if she could do anything she wanted. Allen began with occasional Shabbat services in fall 2007; the following year they became more regular and organized, and she led her first High Holiday services in the woods. Now, the congregation has established some traditions, like the Cranberry Shabbat; Bernstein makes cranberry sauce and cranberry bread with the harvest and donates them to a veterans shelter in Worcester for Thanksgiving dinner. The people who come to Ma’yan Tikvah feel much the same way. Elan Riesman of Acton loves to hike. The Blue Hills Reservation is a favorite spot, and so are the White Mountains in New Hampshire. He has joined Ma’yan Tikvah for Shabbat outings on a several occasions. Keenly aware of climate change and other issues threatening the environment, Allen makes time to participate in environmental education and advocacy work, efforts she also sees as faith-driven.